Today is April 25. It's the day after April 24 - our Armenian Genocide Day of Remembrance. The flags on the cars are off now. The Armenian political parties have all settled down. The April 24 programs are over and done with in our schools, and we're back to life as we know it. It feels like once a year, everyone comes out of the woodwork to show their Armenian-ness. The Facebook profile pictures change for April 24. Red, Blue and Orange; eternal flames, and messages of "Never Again" started popping up a few days before the 24th. Don't get me wrong. There is nothing wrong with remembering our past. The atrocities committed by the Turks against our people were horrific, barbaric, inhuman, and there is no justification for it. We should never forget, but, we should also not wallow in our past. Both of my grandmothers were genocide survivors. They both lost their families in front of their eyes. Both came to the U.S. with nothing and made something of their lives. I remember growing up in their shadow. They - who had experienced the unimaginable - didn't dwell on their past. Instead, they brought us up to love God, get an education, remember to vote, love this country and be kind to others because truly, others had shown kindness to them. In other words, they focused on their lives in the present. The past was there, and yes, when we asked, they would share with us with tears. But they embraced this new country - the U.S. - and taught us that you can bloom where you're planted. On my way into work yesterday, I read a text from my sister Susan in response to the day. It said, "Remembering and resurrecting are not annual occurrences, but embraced tragedy transformed to living love." We are a strong people with a proud heritage. It does us no good to say, "Armenians were the first nation to accept Christianity if we don't accept the Christian response - to love one and care for one another. We can't honestly say, "Never Again" when there is a genocide going on today - TODAY - in Darfur and we turn our backs on it because the victims are not "our people". We can't look at the photos of our starving people and then turn our backs on those that are hungry and homeless in our community and globally. The time is here for resurrection! The best way for our people to acknowledge the genocide is to show that we are victorious over the systematic annihilation of our people that was the dream of the Ottoman Turks. I am proud to be involved in our outreach organization, In His Shoes. This organization was started as a direct response to our Armenian genocide. 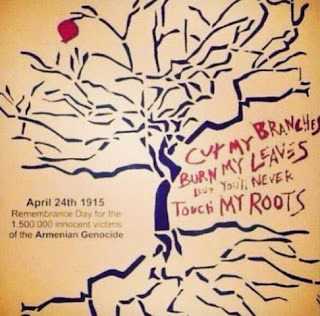 We as Armenians have "been there and done that!" We have been hungry, hurt, homeless, poor, lonely, starving, and yet we are still here! Now it's time to give it back. Thank God for our resurrection by walking In the Shoes of others who are suffering. So this April 22, we partnered with Ascencia, Glendale's homeless shelter and our crew prepared dinner for the residents there in memory of our past. This is in addition to our monthly homeless outreaches to downtown's Skid Row where we have fed and clothed the people there for close to 5 years now. We are fasting weekly for Darfur in Stop Genocide Now's 100-Day-Fast and donating our food money to the Little Ripples program - which will give young displaced Darfuri children a chance at education. And just yesterday, a small group walked - not with flags and banners, but with their hearts full of love and compassion - 17.5 kilometers from Pasadena to the Armenian Genocide Monument -- remembering one genocide, by working toward stopping another one. We have the power. There is a beautiful remembrance banner I saw on Facebook yesterday. 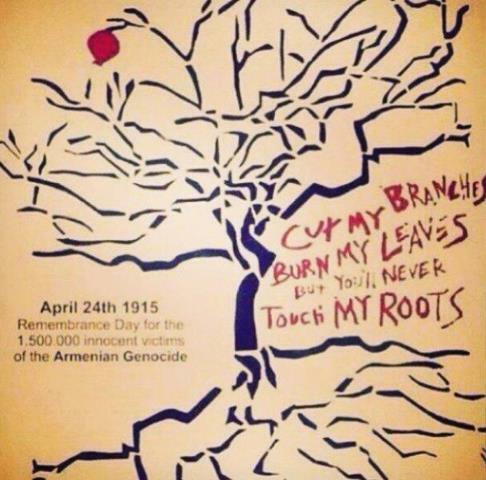 It says, "Cut my branches, burn my leaves, but you'll never touch my roots". Let's remember where our roots lie - with Faith in God, Hope for a brighter future, and Love for one another. Armenian or not. You can hear the audio version of this blog post on this week's episode of "The Next Step with Fr. Vazken" on epostle.net or available for download at your itunes store. Beautiful post! Just a small correction: the Skid Row outreach is going on 6 years! We started a month after the 7x77 Forgiveness conference.